“Management has delivered on what is in their control in the medium term: cost, capital and liability optimization,” JPMorgan Chase analyst Kian Abouhossein said. 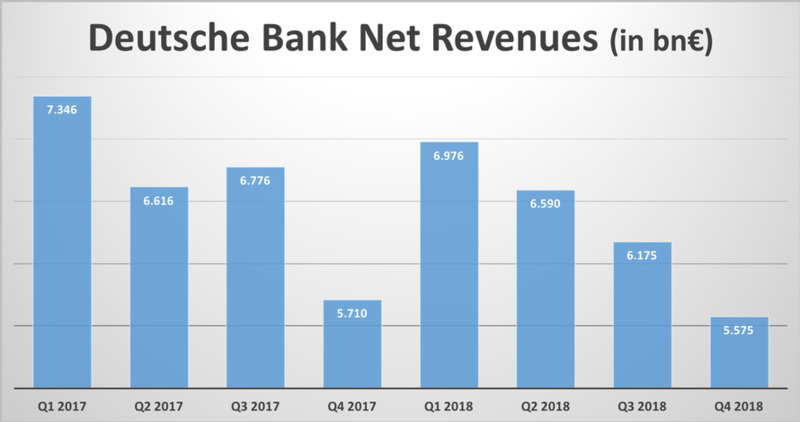 "However, for now, we remain concerned about Deutsche Bank’s inability to turn around fixed-income trading." To be sure, DB's CFO tried his best to spin the results in a favorable light: "We feel we are in control of our destiny, we’re executing against our plans,” James von Moltke, the bank's chief financial officer, said in an interview on Bloomberg TV. Still, "there’s a lot of talk in the sector overall, that over time mergers, consolidation in the European banking sector would be sensible for a variety of reasons. We’ve tended to agree with that." While a deal is viewed by some as an imperfect solution, the German government -- which on Wednesday slashed its economic growth forecast for this year -- has said it wants strong international banks to support Germany’s export-oriented companies. The country still owns a large stake in Commerzbank after a bailout. It doesn’t own a stake in Deutsche Bank. The good news is that for now at least, DB, which was the worst performing Stoxx 600 member in 2018,is still up on the year. We don't expect this to hold, especially if the yield on longer-dated European yields keeps sliding and there is no rebound in Germany's economy, which after today's terrible German Mfg PMI is not looking likely.